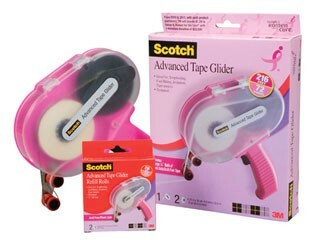 The Scotch ATG applies a thin, strong line of adhesive that bonds instantly and goes on easily while removing and rewinding the liner. Perfect for scrapbooking, card-making and other paper projects. It features covered gears to minimize applicator jams, a transparent cover that shows remaining tape, and it holds up to 36yds of adhesive tape. This package contains 1 ATG gun (9-1/2" x 9" x 2"), (2) 36 yd rolls of 1/4" wide acid-free/photo safe tape, and instructions for use. Uses 085-RAF refills.